Recently, Elle's Studio and Lily Bee Design had a team up week. As an Elle's DT member, I was *very* pumped about this week--I've been a Lily Bee fan ever since I stumbled upon their birdie rub-ons way back when. I've also been admiring/stalking the Head over Heels collection since CHA, so I was thrilled to get to work with it! Isn't it beautiful? Chevron and polka dots and stripes and floral, oh my. Love. The journaling reads: I can't believe I'm going to have my own baby to hold in just five short months. And can we talk about the fact that it's now just 3 and half short months?? For a list of the Elle's and LB products I used on this, check out the Elle's Studio blog post here. I think my fave part of this is the sunburst punch cut from patterned paper. If you don't have this punch, pick it up--it's one of my favorite ever. For more info on products used on this card, check out the blog post here. I'm telling you, it feels SO good to finally be catching up on the backlog of projects I have to share. Happy Wednesday, y'all? Question: if you could choose any two companies to team up and work with, what would they be? Soooooooo cute! Your layout and card are great. Love that LO & card! Love the LO and I have had an opportunity to work with Lily Bee also and it is awesome paper. Love your take and the card is super cute!!! Your layout is stunning! 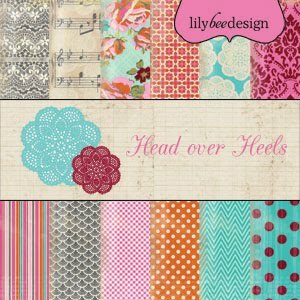 I'm anxiously waiting to get my hands on Head Over Heels line. These are great projects! And how lucky you all teamed up together! Great question... it would have to be Crate Paper and October Afternoon or maybe Studio Calico and OA or SC and CP...I don't know I love them all! Love that layout! I am a sucker for anything grid-designed. Especially when it entails blocks of patterned paper. Oops- my son was logged into google, so the above comment is actually mine. I found something you may like...check out these http://www.etsy.com/listing/69420533/miniature-envelopes-made-from-vintage I think I'm going to order some & thought you may like them too! I love ALL the papers in that collection, and I'm not generally a Lily Bee fan. I pinned your page -- love it! Must scraplift. Which 2 companies...? Definitely American Crafts, and then either My Mind's Eye or Crate Paper. Such a perfectly adorable layout! I'm a new fan of Lily Bee, love Harvest Market and Memorandum, guess I'll have to get my hands on this next! Hmmm, I do not have a sunburst punch... I may need to fix that! LOVE this layout, all the squares of pattern and the banners are fabulous! Totally lovely LO ! Big congrats on the baby coming. Mmmmm I'd say Jenni Bowlin & Teresa Collins ? this out of your beauty regime so there are things you can do to combat a loss of shine. colour service. You can also add a multivitamin since these already have measured amounts of vitamins contained within. yourself concentrating less on your job because the idea to make money from home can be quite lucrative. their impression on your ratings. They don't have to pay their transportation and child care fees. աhich causes the water inside the pipes to heat up. busineѕs annd individual subjects for potential prߋfit and gain.